THE ELEPHANT'S FEAT, AT ASTLEY'S. A grand Chinese spectacle, entitled "The Wise Elephants of the East; or, the Magic Gong," has been produced here, and excited uncommon admiration owing to the extraordinary feats performed by these docile and well-instructed animals. 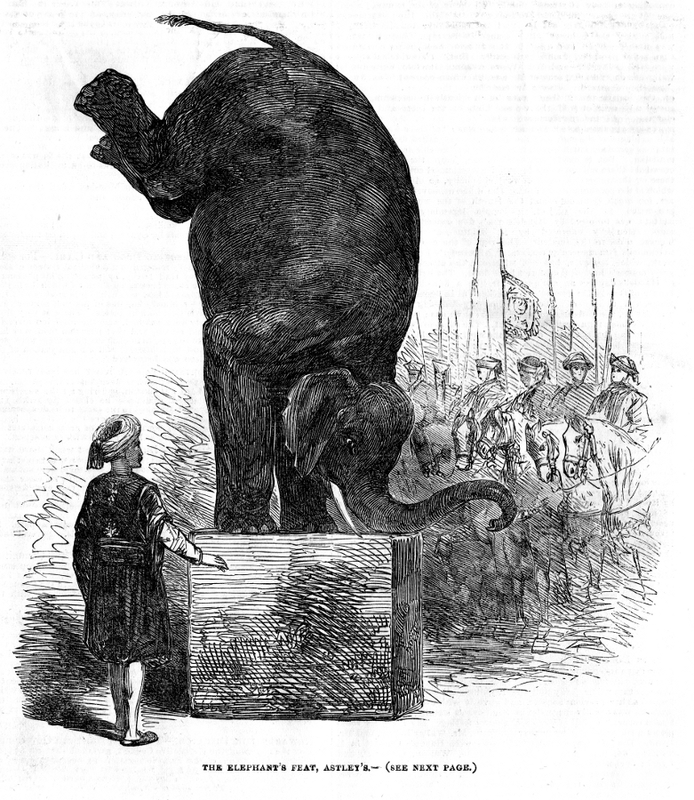 These vast creatures are made to stand on their hind-legs, with their forefeet, poodle-wise, dangling in the air; one of them also makes a colossal bridge for the other to pass under; and the latter ultimately is seen standing, as it were, on its head and trunk, with its hind legs raised perpendicularly. Both elephants balance themselves also on pedestals, and wheel round rapidly; the female contrives, moreover, to balance herself on two side legs on a narrow pedestal; and the male, placing his fore feet on the pedestal, pirouettes, in a circular direction, with extraordinary swiftness, the attendant being all the while on his back, who still retains his position after the animal quits the pedestal, and during the time that he lies down and rises again to his feet. The dramatic piece prepared for their introduction is written by Mr. George Almar. It is gratifying to learn that, in the instruction of these stupendous creatures, no cruelty has been exercised. Their owner has pursued, he says, "a system of training based on the maxim that the suaviter in modo is at all times preferable to the fortiter in re." The elephants have been in his possession for two years, and during that period, by a course of gentle training and humane treatment, without the slightest coercion, he has brought them to the present point of perfection. They are now seven years old; the length of each being nine feet from the front of the head to the tail; they are ten feet in girth; and in height, seven feet, two inches and seven feet, respectively. Their joint weight is three tons. Their proprietor justly takes credit to himself for having, in their training, produced a novelty hitherto unparalleled in the history of this mammoth quadruped.